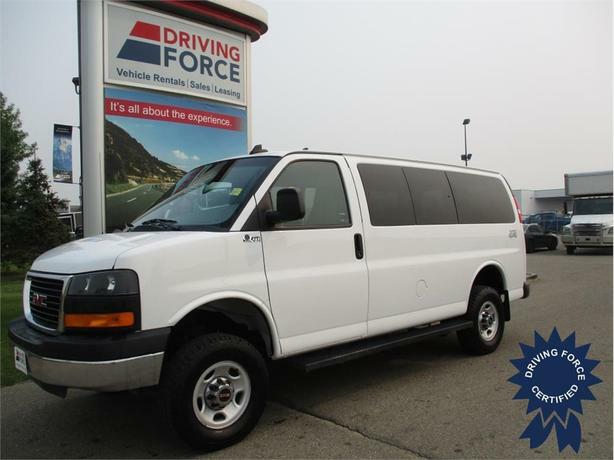 This 2016 GMC Savana 2500 Quigley 4X4 Conversion 12 Passenger Van allows you to get people into the most remote areas. Features include a 2-3-3-4 seating configuration, factory trailer tow package, 4-Low, 4-High, Neutral, and 2WD selections, an easy clean vinyl floor, rear vision camera, side entry grip steps, Alberta CVIP Bus Inspection, 120V power inverter, 3.42 rear axle ratio, OnStar, power windows, power door locks, keyless entry, balance of factory GM warranty, fresh service and 120 point certification. The Vortec 6.0-litre V8 gas engine provides 342 horsepower at 5400 RPM and 373 lb-ft of torque at 4400 RPM. The GVWR rating is 8,600 lbs (3,901 kgs). Call or email one of our hard working and knowledgeable commercial vehicle sales specialists today and experience the DRIVING FORCE difference.